Earlier on Saturday morning, 1,322 players arrived at the Stockholm International Fairs to compete in the main event with their best Modern decks. 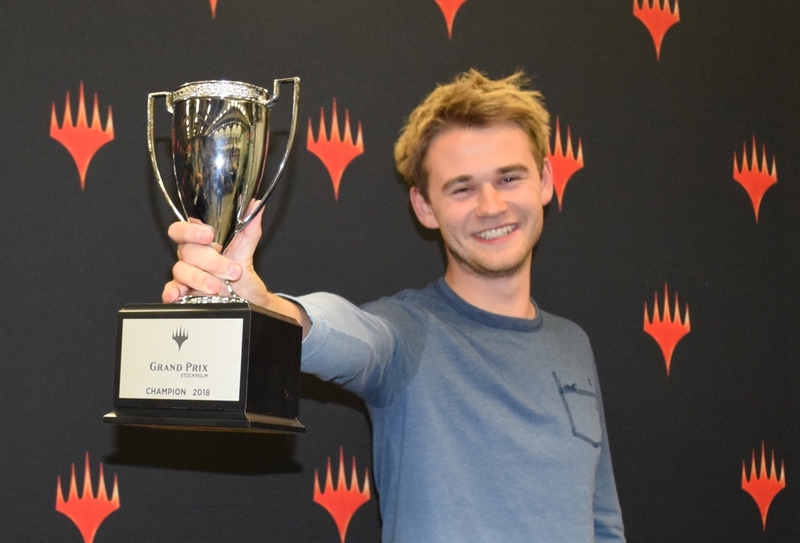 In the end, it was Ondřej Stráský who emerged triumphant with Bant Spirits, defeating Joel Larsson and his White-Blue Control deck in the finals. Modern, which takes its name from the "Modern" card frame redesign that happened nearly 15 years ago, is one of Magic's most popular formats. As demonstrated by the Day 2 metagame breakdown below, W/U Control was by far the most popular choice, but the format boasts a huge diversity of viable deck archetypes. When I look at this table, two things stand out to me. The first thing that I find remarkable is how many of today's top-tier Modern decks didn't even exist, or at least not in their current form, a year ago. White-Blue Control, for instance, has benefited considerably from the recent additions of Search for Azcanta, Field of Ruin, Jace, the Mind Sculptor, and Teferi, Hero of Dominaria. Bant Spirits wasn't seen much until Core Set 2019 introduced Supreme Phantom. Humans wasn't competitive before Ixalan brought Kitesail Freebooter and Unclaimed Territory. And the Hardened Scales deck simply took players a long time to figure out. All in all, for a non-rotating format, I am impressed by the dynamic and ever-changing nature of the metagame. The second remarkable thing is the huge diversity of viable deck archetypes. There were even 21 singleton deck choices that we couldn't fit into the table: 8-Rack, Amulet Titan, Cheerios, Devoted Evolution, Dredge, Grishoalbrand, Grixis Control, Jeskai Ascendancy combo, Jeskai Ascension, Jeskai Mentor, Jeskai Tempo, Kiki-Chord, Living End, Mardu Pyromancer, R/G Eldrazi, R/G Ponza, Thopter Sword, U/R Breach, U/R Enigma Drake, W/B Zombies, and W/U Spirits. Basically, there is a competitive deck for every style of player in Modern, and you never know what decks you might face in a Modern tournament. On Sunday mornings at GPs, coverage always starts with the segment known as Good Morning Magic. This segment showcases some of the wackiest, spiciest, and weirdest brews to make it through to Day 2.Let's take a closer look at three of the best-performing decks from that segment. This deck's combo revolves around Jeskai Ascendancy. With the enchantment on the battlefield, you get to untap your creatures every time you cast a noncreature spell. That works very well with Fatestitcher, which can untap lands to generate mana. This mana can then be used to cast card-drawing spells, allowing you to sift through your deck. Meanwhile, you're continually growing your Fatestitchers, which eventually attack for the win. Gutiérrez von Porat told me it was a metagame choice. "It's really good against White-Blue Control," he said. As he explained, in Game 1 they usually only have 2-3 counters that cost less than 3 mana, which means that it's easy stick an early Jeskai Ascendancy or Pyromancer Ascension. And in Game 2, when many White-Blue Control players would cut Terminus to add Rest in Peace, he planned to take out some of his combo pieces and bring in Young Pyromancer and Monastery Mentor. That transformational sideboard had caught several of his opponents off-guard, and it was instrumental in his Round 9 feature match victory. The main game plan of this deck is to sneak Griselbrand onto the battlefield via Goryo's Vengeance or Through the Breach. You then use the Demon's activated ability to draw a bunch of cards, exile Worldspine Wurm to Nourishing Shoal to draw even more cards, and eventually win with Borborygmos Enraged. One of the most important cards in Jönsson's sideboard was Pact of Negation. Yesterday, he used it as a timely counter and was even able to pay the upkeep cost: via Simian Spirit Guide and Manamorphose, he amazingly reached 3UU mana with his red-black deck. And today during his Round 9 feature match, he used it to counter Dispel to secure a turn-two kill through disruption. It doesn't happen every weekend that a deck showcased during Good Morning Magic makes it to the Top 8, but Elias Klocker got there. A key card in his deck is Ranger of Eos, which can fetch Martyr of Sands, and Serra Ascendant. A single Martyr activation can easily get you up to 30 life, at least when your opponent doesn't have Nimble Obstructionist. In the late game, the deck can recur its creatures with Emeria, the Sky Ruin or Proclamation of Rebirth. Klocker chose the deck because he had been "crushing all the leagues". According to him, creature matchups are basically a bye. He felt that the matchup against White-Blue was decent too: "if they don't stick a planeswalker early, then I can grind them out with my lands and Squadron Hawks." There is always more to a Grand Prix than just the main event. Besides a variety of side events, you have the chance to meet cosplayers, artists, pro players, old friends, and new friends. There's something to enjoy for everyone. We received a lot of good, fun contributions to this caption contest; thanks to everyone who participated. I particularly liked the one by @THETannonGrace: "How does he always have turn three Tron??...." But my personal favorite was the one suggested by @BehrendNinja: "Karn has decided to exile you...." It perfectly captures the terror in Larsson's eyes. Getting your favorite card signed by the artist is always great, but it's even more special when your likeliness appears in the artwork. After winning the first Magic Invitational over 20 years ago, Hall of Famer Olle Råde designed Sylvan Safekeeper, and this weekend he finally got his hands on a signed copy. There will be a playoff between Luis Salvatto (left) and Seth Manfield (right). Grand Prix Stockholm marked the conclusion of the 2017-2018 professional season. This meant that the Player of the Year title, which is awarded to the player who earns the most pro points over an entire season, was decided at the end of the weekend. The race had been extremely close in recent months. 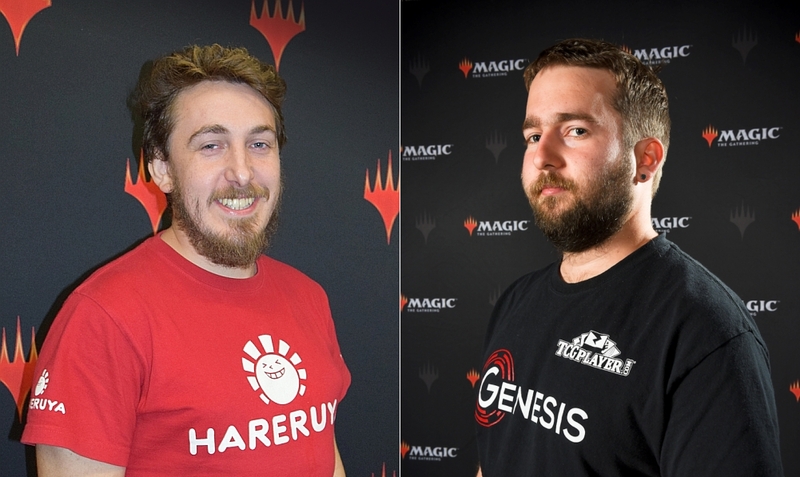 Seth Manfield, who skipped this weekend's Grand Prix to focus on World Championship preparation, held a seemingly comfortable 3-point lead over Reid Duke and Luis Salvatto, but both of them were in attendance to try for the title. While Duke failed to make Day 2, Salvatto had an amazing run. 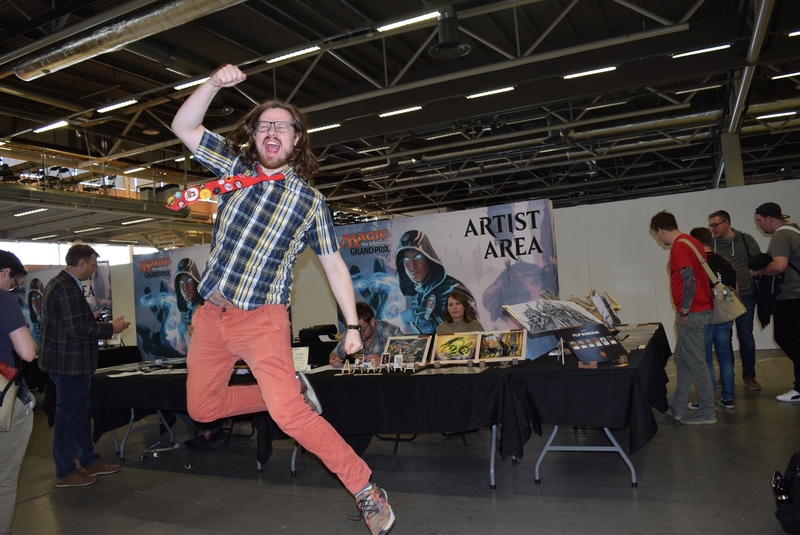 He entered Day 2 with an 8-0 record, lost no more than 2 matches in the remaining Swiss rounds, and advanced to the Top 8 with his White-Blue Control deck. He needed to make the semifinals to take Player of the Year outright, but he lost in the quarterfinals to Ondřej Stráský. As a result, the race for 2017-2018 has ended in a tie between Luis Salvatto and Seth Manfield, and thus there will be a playoff. The details are yet to be announced, but a Player of the Year tie has happened once before. For a historical precedent, I can refer you to the awesome Player of the Year showdown between Brad Nelson and Guillaume Matignon, in which Brad Nelson emerged victorious as the 2010 Player of the Year. Get your hype ready. Well @LuisSalvatto wanted to beat @ReidDuke in the top 8 of #GPStockholm he will have to settle for *trying* to beat me instead, wouldn't have wanted it any other way #POY. Happy to have one more bite at the apple. Besides the Player of the Year race, the 2018 World Magic Cup (WMC) captaincies and the Pro Club levels for the next quarter were also decided at the conclusion of Grand Prix Stockholm. Simon Nielsen celebrates his Danish WMC captaincy. The closest captaincy race for the WMC was for Denmark. The race was extremely close going into the event, with Simon Nielsen, Michael Bonde, and Thomas Enevoldsen all vying for the position as their nation's top Pro Points earner. But as Grand Prix Stockholm concluded, it was Simon Nielsen who clinched it. Congratulations! It was a good weekend for Celestial Colonnade, with three W/U Control decks and one Jeskai Control deck in the Top 8. But it was an even better weekend for Bant Spirits, with Ondřej Stráský carrying the deck to a first-place finish. Several weeks ago, as detailed in the Top Stories of Grand Prix Prague, Stráský was ready to quit professional Magic. "I'll play one more GP (Prague) and unless I win it's going to my last tournament in a long time," he wrote before the event. There, he took his Bant Spirits deck to the semifinals before losing to eventual winner Lauri Pispa. At that point, he wasn't sure whether to retire or not, so he figured he had to go to one more Grand Prix. It was a good decision. After reaching the Top 8, which gave him enough Pro Points to reach Gold level in the Pro Players Club, he changed his Twitter bio to "unretired." "I think it's mostly due to the Bant Spirits deck," he said afterwards. "It fits my play style—it's a great deck." For a long while, Stráský was on Merfolk as the deck he liked to play, and he liked how similar Bant Spirits was. He claimed that Supreme Phantom pushed Bant Spirits over the top, and he believes it's the best deck in Modern right now. Stráský didn't stop winning after he made the Top 8. His first victim was Luis Salvatto in the pivotal match for Player of the Year. He then defeated Oliver Moon in a mirror match by consistently hitting multiple Spirit lords with Collected Company. And he finally bested hometown hero and end boss Joel Larsson, who had just overtaken Elias Watsfeldt as the Swedish WMC captain and received support from his parents in the crowd. In Game 1 of the finals, Stráský had turn-2 Geist of Saint Traft on the play, and the game was over in less than 2 minutes. In Game 2, Larsson found three timely copies of Terminus in his first 20 cards or so, which was enough to even the match at one game apiece. In the final game, Stráský had an excellent Supreme Phantom pushed Bant Spirits over the top, and he believes it's the best deck in Modern right now. Stráský didn't stop winning after he made the Top 8. His first victim was Luis Salvatto in the pivotal match for Player of the Year. He then defeated Oliver Moon in a mirror match by consistently hitting multiple Spirit lords with Collected Company on turn 3, dodged Terminus for two turns, and took the trophy! If this is what retirement looks like, then that's one hell of a "retirement." Congratulations to Ondřej Stráský, your Grand Prix Stockholm 2018 champion!